Jon F. Sutter has written Lean Accounting for the organization with a mature Lean Production System. Does the critical mass change of your organization’s culture allow for continuous improvement changes to be readily absorbed as normal? Are standards in place and relied upon to make business decisions? Does your balance sheet show improvement directly traced to Lean implementation? Is performance so strong that everyone in the organization sees the impact and no one can deny the facts of the value of the Lean Production System? 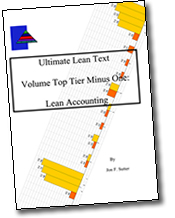 You are ready for Lean Accounting. Basic training and explanations of lean tools and techniques are not included is this book. It is assumed that the reader is a Lean Master and has the technical background to understand the book and the concepts within. Lean Accounting solidifies the Standard Operations process measurement tools into a seamless information process that starts at the shop floor product level and flows through to the long term planning of the organization. The common language of the organization becomes Lead-time, Cycle-time and Takt Time. Dollars are the language of the finance group and still the measure of the purchased materials. Dollars are no longer the language imposed upon operations by finance to measure annual budget needs. Continue your Lean journey today! Available for $75 (includes shipping).